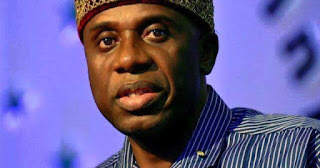 Minister of Transportation, Rotimi Amaechi has reaffirmed federal government’s plan to commence freighting of petroleum products by rail from the nation’s seaports and refineries for onward distribution to consumers in the hinterlands. The move followed the hitches often encountered in distribution of petroleum products by road transport. The collapse of Nigeria’s underground pipeline networks, about 10 years, had resulted in trucking of products by road with its attendant problems including gridlock. The trucking of petroleum products across the country has also affected the timely delivery of products given the delays associated with bad roads in most parts of the country. Amaechi said work on the narrow gauge rehabilitation project had reached an advanced stage, adding that it would be utilised for movement of such cargoes like petroleum products by marketers this year. The Minister disclosed that the federal and Lagos State Government were working out modalities to bring to an end the gridlock at the Apapa axis of Lagos by fuel tankers queuing to procure petroleum products from the numerous tank farms located there. According to him, the ministry, in partnership with other relevant ministries in the petroleum and transport sectors, would take steps to ensure that fuel supply to airlines at the Lagos domestic and international airports is done in such a way that it will eliminate the indiscriminate parking of trucks along the airport routes with all the potential threats to the safety of the airport and allied facilities.